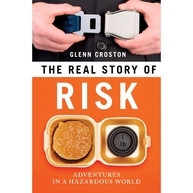 The Real Story of Risk explores our twisted relationship with the risky world we live in. Risks are not just out in the world around us, or in statistical tables, but in the surprising ways we see and feel our way through the world everyday. The risks are many. Every day we’re up against cancer, earthquakes, financial crashes, terrorism, crime, heart attacks, car accidents, and oil spills. The dangers are as big as the sun or as small as a virus, as exotic as a shark attack or as mundane as slipping in the bathtub. It’s a wonder we manage to deal with it all. Often we don’t. Often we get the risks completely wrong, even when we know better. We do our best to ignore common hazards like heart disease, which kills one in five people in the <?xml:namespace prefix = st1 />United States, while we are terrified of sharks, which are mainly a hazard in movies. We shrink in fear from snakes, which affect a handful of people each year in the United States, but somehow in 2006 we were blind to the looming financial crisis until it came crashing down all around us. This story plays out over and over many times in many different ways. How we see the world is frequently and wildly out of whack with the real world all around us. The answers are rooted deep in our nature and far back in time. We are marvels of evolution, with our brain and body capable of wonders we scarcely understand, but we are also ill prepared in many ways to deal with the world we face today. The problem is that while we are marvels of evolution, we evolved in a different world. Humanity’s roots lie in eastern Africa in a long string of ancestors that emerged over the last few million years. Gradually over time, these ancestors became more and more like modern humans, arriving at our present biological state as Homo sapiens about 160,000 years ago. While the hazards early humans faced, like snakes and predators, have faded, new risks that early humans could never have conceived of have taken their place. The world has changed, but our minds and bodies have not, leaving us poorly equipped to handle the risks of the world we live in today. We may know how to reproduce, find calories, and avoid a charging buffalo, but we deal poorly with the risks of public speaking, the fine print in mortgages, and junk food because our nature leads us astray. Risk is often seen as a matter of statistical tables used by insurance companies and complex models run by hedge funds to stay one jump ahead of the ever-shifting tides of financial markets. But for most of us in our daily lives, the journey into the world of risk is not one of statistics and financial models but an adventure in a distorted world. Risk is not something we can fully describe based on probabilities, but it is something that we think and feel our way through, moment by moment, every day of our lives. The Real Story of Risk explores our relationship with a world of risk, and maybe even better navigate this world.